Aches, pains and other: Just my back still. Every night I end the day by taking and bath a putting a heating pad on my back. The flashes of sciatica are coming more frequently. I am afraid. Very afraid. 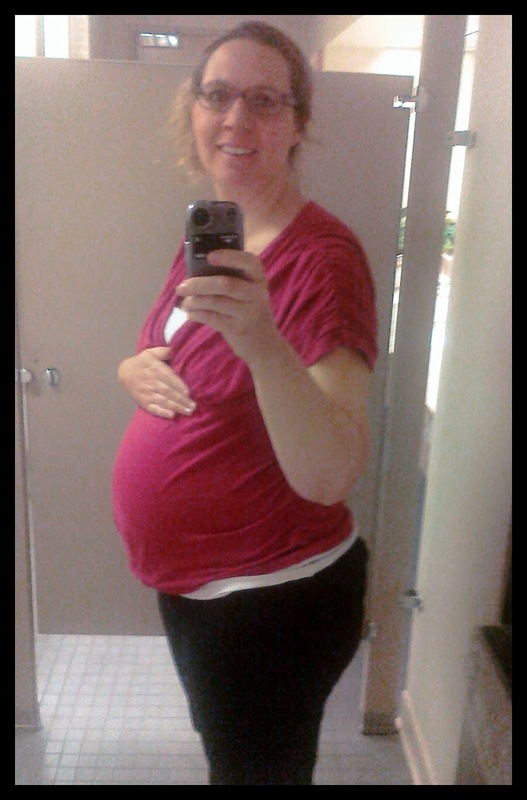 Milestones: Officially in the third trimester by any standards. I clearly didn't pull out all the stops when getting dress this morning. I can't believe how short this shirt is already. I also can't believe I still have 12ish weeks of growing left to do. Amazingly, this week, despite eating crappy most of the time, I actually didn't gain much. About .8 pounds. Which is about normal but for me that is an almost negligible weight gain. Maybe, maybe, maybe, my body has finished with the massive preloading of fat for the little guys final growth push. Honestly, I am just about to the point that I don't care about the weight gain anymore but I'm not 100% there yet. I still worry about weighing in at the doctors and showing a 5 pound gain in a 2 weeks. But Thanksgiving is coming up so, you know. In other baby preparation news, we finished painting the new nursery and will be moving all the furniture in next weekend. I am very worried about messing with Caroline's sleep but we don't have a choice.